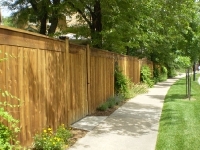 Wood Privacy Fences enhance the beauty of your property while adding value and security as well. 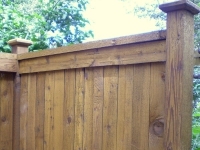 Western Red Cedar is our wood of choice and ther are many vairations on the standard privacy fence that can be built. Please browse the gallery for examples. Standard Cedar Privacy fence with 6-inch dog-ear pickets. 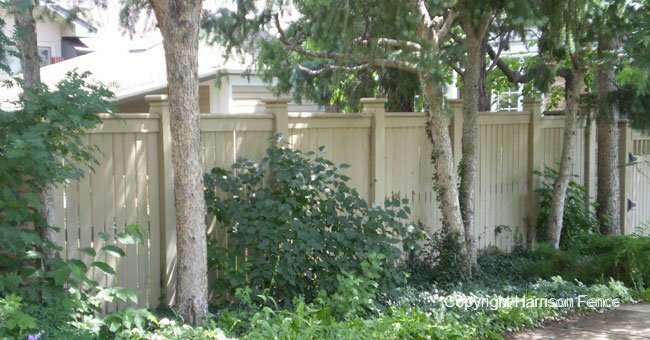 This is one of the most common privacy fences. 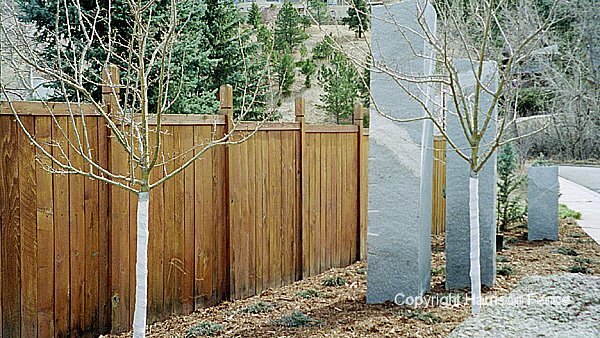 Economical and practical, it also looks great in your yard. Closer view showing the tops of the pickets. Although the pickets are cut to a "dog ear" ,the top of the fence line remains straight and level. 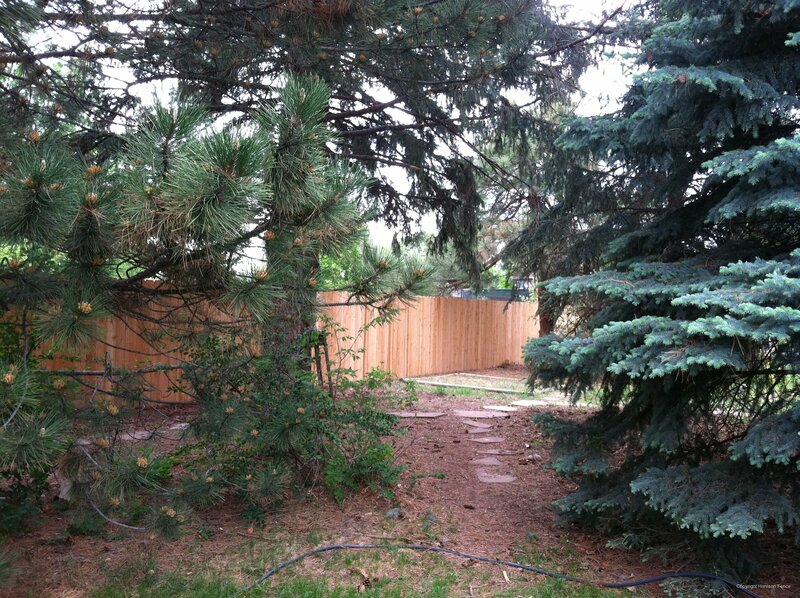 This is the traditional cedar privacy fence. 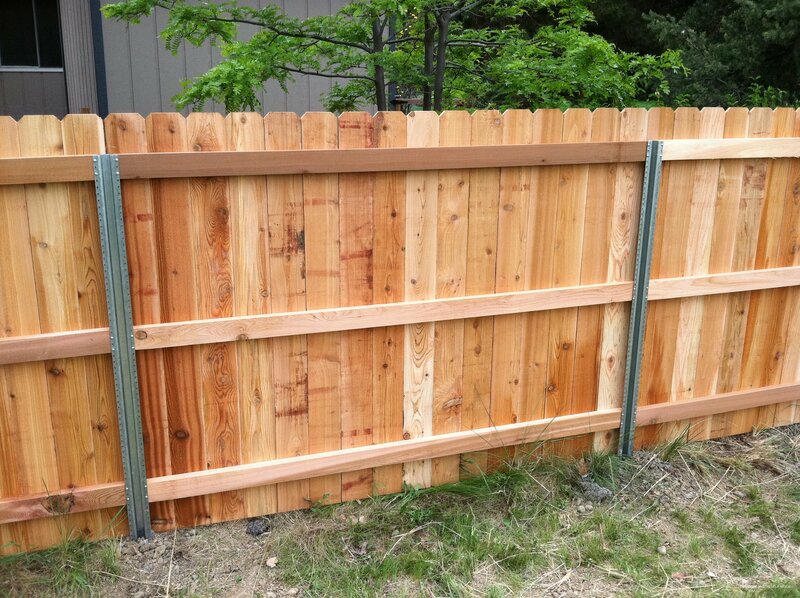 This fence uses 4 inch wide vertical pickets with what is know as the “dog-ear” top. The top of the picket has a slightly rounded. 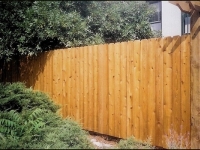 This style of fence provides privacy and security for your property. 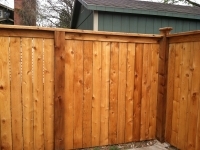 The most standard height for this fence is 6 feet tall, however, this fence can be built any height (local building-codes permitting) to suit your needs. 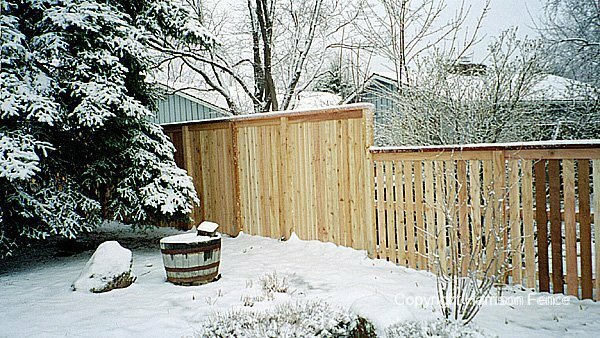 Another version of the traditional cedar privacy fence, this application uses a wider picket. 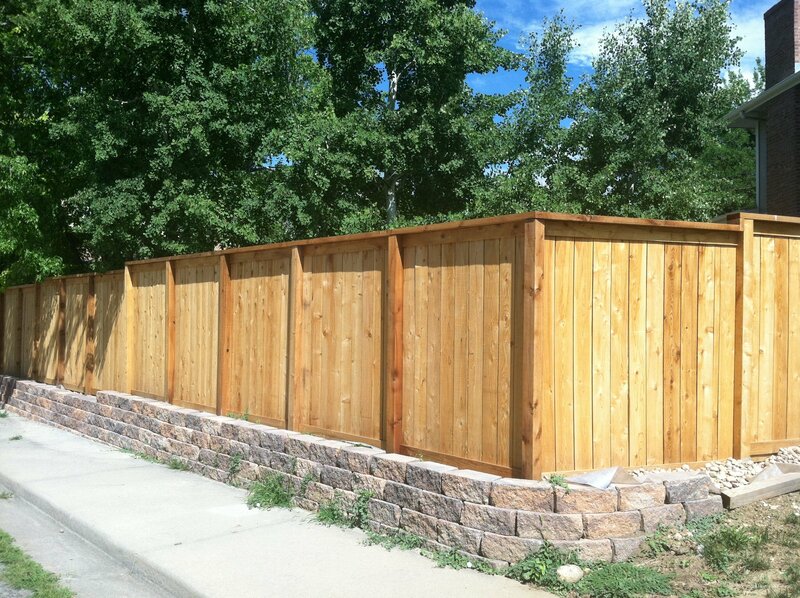 Again, this privacy fence style will provide maximum privacy and security for your property. 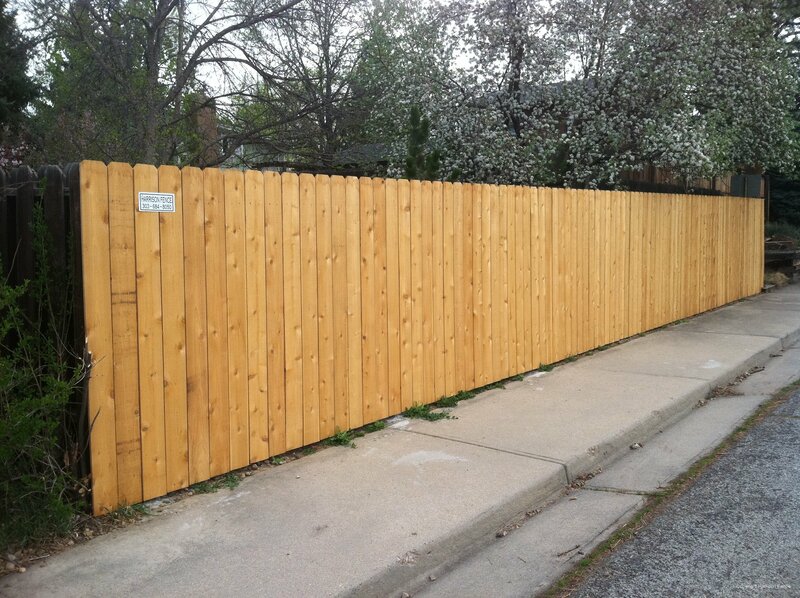 This fence can also be constructed in any height (local building-codes permitting) to suit your needs. 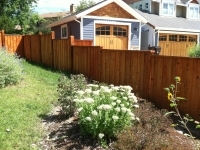 The shadowbox style fence provides privacy and architectural variation for your property. Viewed from an angle, the pickets do have visible spacing, but viewed from straight-on, the fence acts as a complete privacy fence. 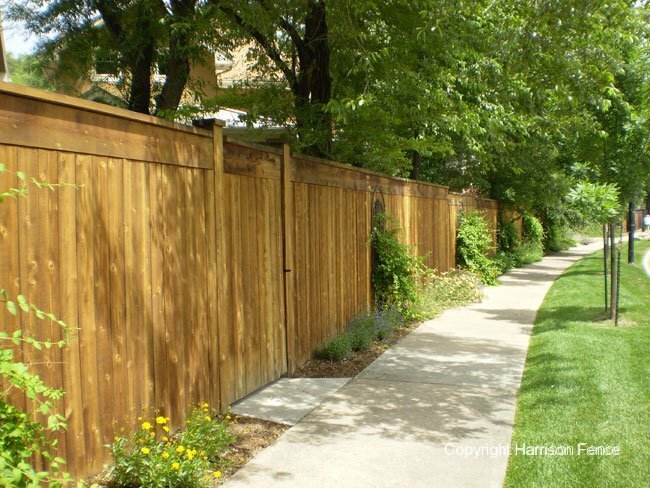 This is a good application for neighbors who wish to have a finished-look on both sides of the fence. 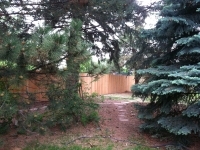 This fence is also good for areas of high wind as it allows air to move through the shadowbox fence. Top Cap Fence "Flush Top"
Another view of the top cap style fence - cap flush across the tops of posts with rails at back of posts to create framed-in look between fence panels. 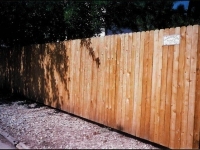 The top cap style fence is the traditional privacy style fence with an added finishing touch. The top cap can be 2”x4”, 2”x6” or with larger post, we can even use a 2”x8” board for the top. 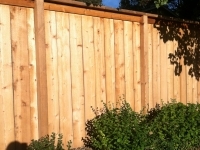 Posts can be flush to the top of the fence as in this example for a smooth, continuous look along the top of the fence. Typically, a 1”x4” fascia trim board will be secured under the top cap to finish the look while concealing the tops of the pickets. 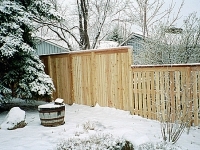 The back side of the top cap style fence shows the three horizontal support rails with the 2x6 top rail as cap. Fence looks beautiful from front and back sides. 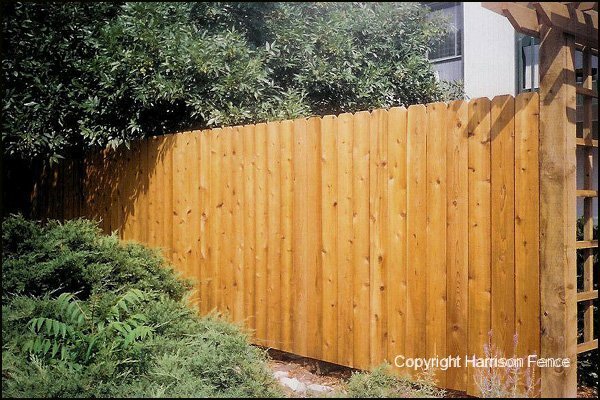 Sometimes referred to as Batten and Board Fence, the pickets on this fence are overlapped to create a full privacy effect. Sometimes referred to as Batten and Board Fence, the pickets on this fence are overlapped to create a full privacy effect.This fence has been stepped-down to follow the property grade while maintaining it's framed-in look. 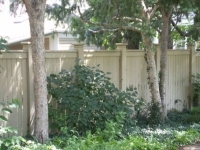 The top cap style fence shown in this photo has decorative posts at the corners and ends. Handmade post caps adorn these posts. 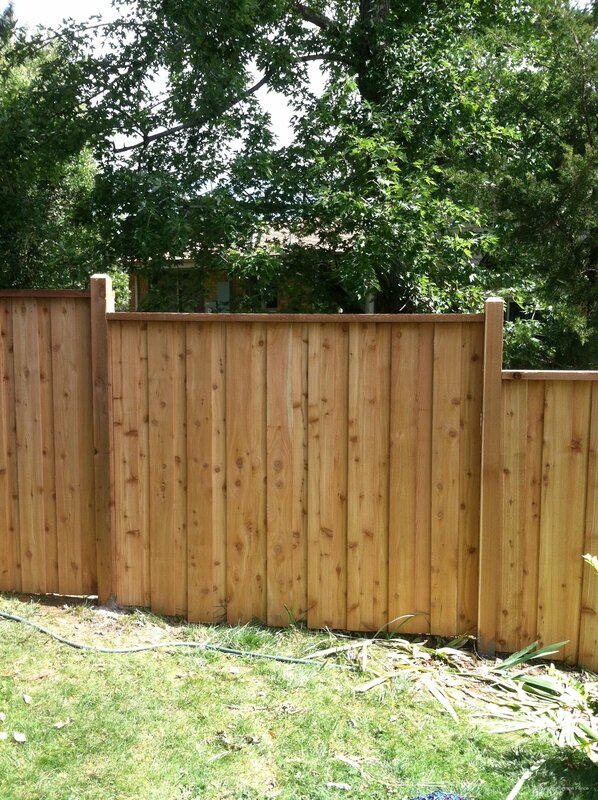 This example of top-cap style fence again has the posts raised above the finished height of the fence. These posts also have decorative caps. 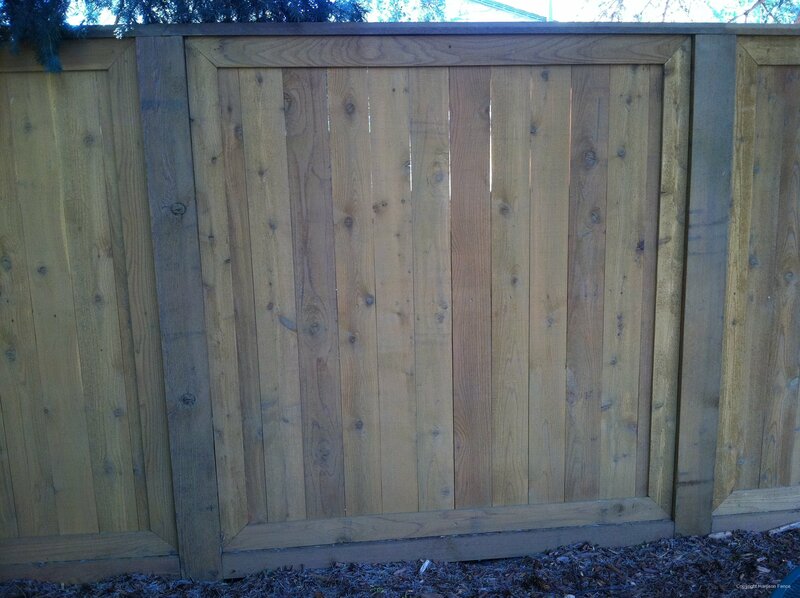 This fence is seven feet tall and surrounds the perimeter of a neighborhood to provide the ultimate privacy fence with style and security. Stylish and elegant, the top-cap style fence will compliment your landscaping while providing privacy and security for your yard. This example has been painted to match the home and blends beautifully with its surroundings. 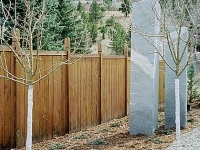 The posts are raised above the finished height of the fence with decorative caps. 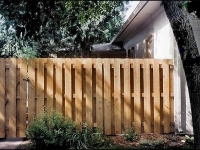 The top-cap style of fence can be dressed up to bring more architectural variation. 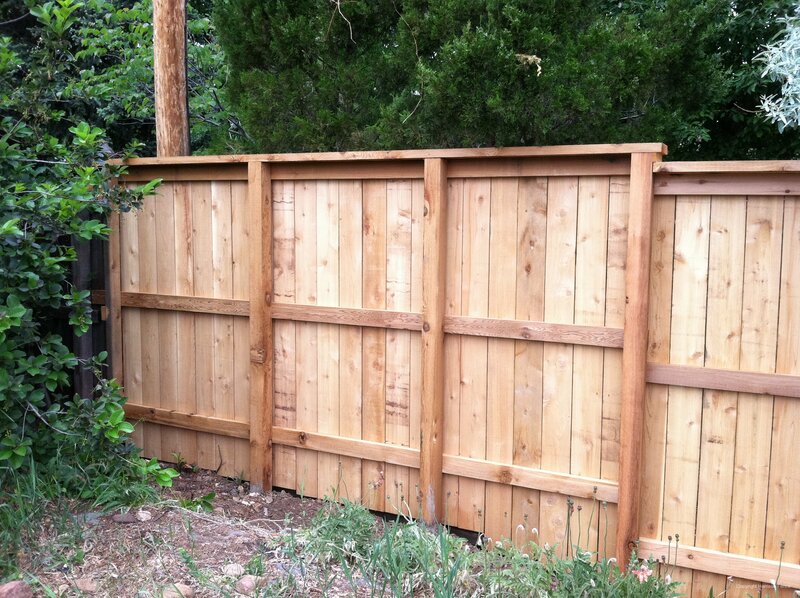 Using larger posts or raising the post tops above the finished top of the fence can accentuate this style of fence. This example shows larger posts with decorative caps as well as a larger fascia trim board. 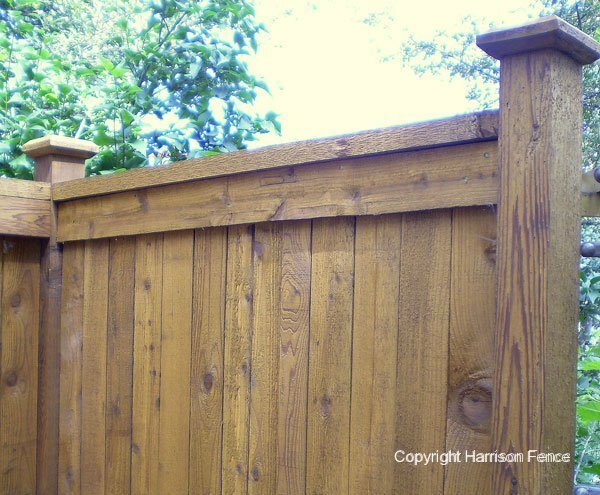 Harrison Fence constructs top-cap fences with the horizontal rails face-nailed to the back side of the posts, with pickets secured to the rails which creates a ‘framed-in’ look for each fence section. 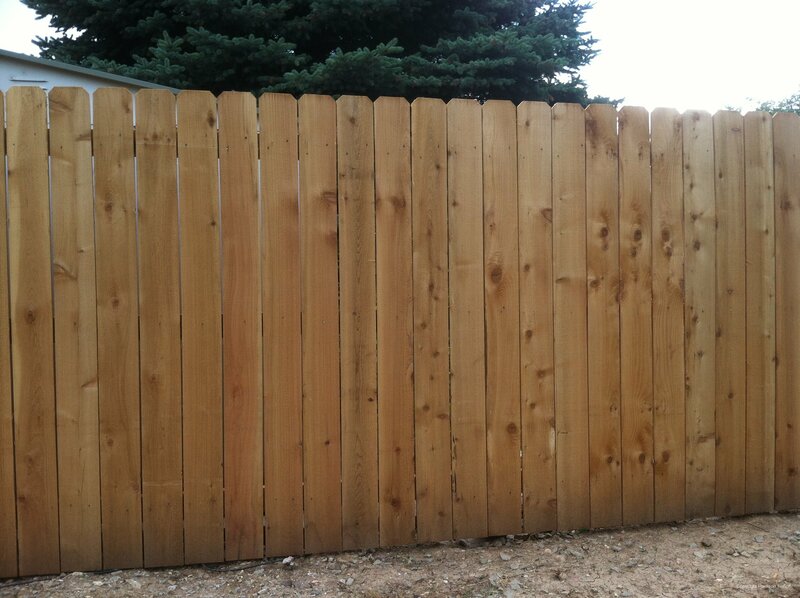 This example shows the standard 4”x4” post, but raised above the fence and with chamfered, dadoed tops. The fence steps-down in sections to follow the sloping grade of the property. This example of top-cap style fence shows the difference between complete privacy and open-picket styles. 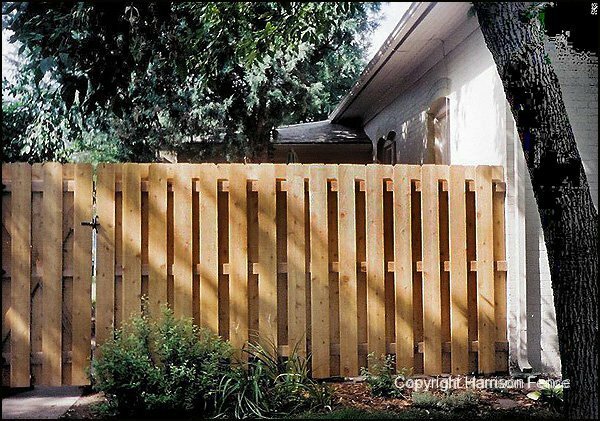 The taller portion of this fence is completely private, while the lower portion of the fence has one inch spacing between pickets for a less-private effect at the front of the property. 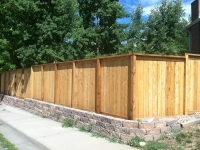 Top Cap Fence - "Framed In"
This top cap style fence uses larger posts with fascia frame boards at top and bottom. The top cap can be 2”x4”, 2”x6” or with larger post, we can even use a 2”x8” board for the top. 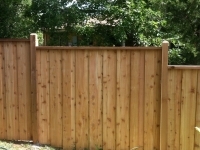 Posts can be flush to the top of the fence as in this example for a smooth, continuous look along the top of the fence. Typically, a 1”x4” fascia trim board will be secured under the top cap to finish the look while concealing the tops of the pickets. Excellent option for Boulder County's windy weather! 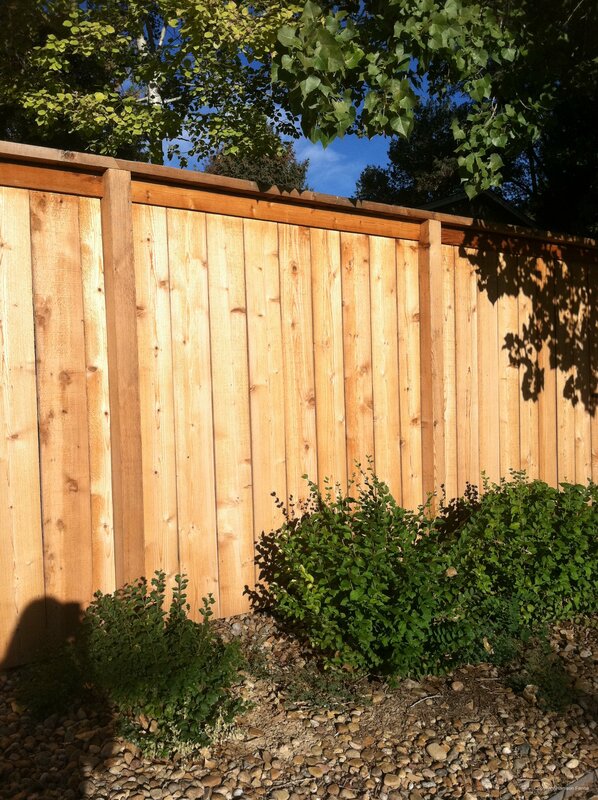 These steel posts are designed to work seamlessly with a cedar privacy fence. The posts will not rot or break at the base. 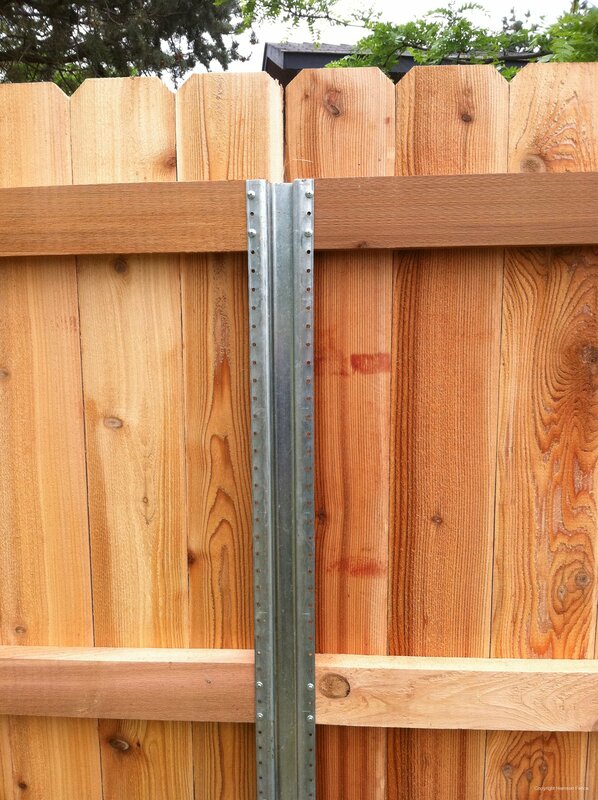 Rails are screwed into the posts, so replacement of wood components is possible. 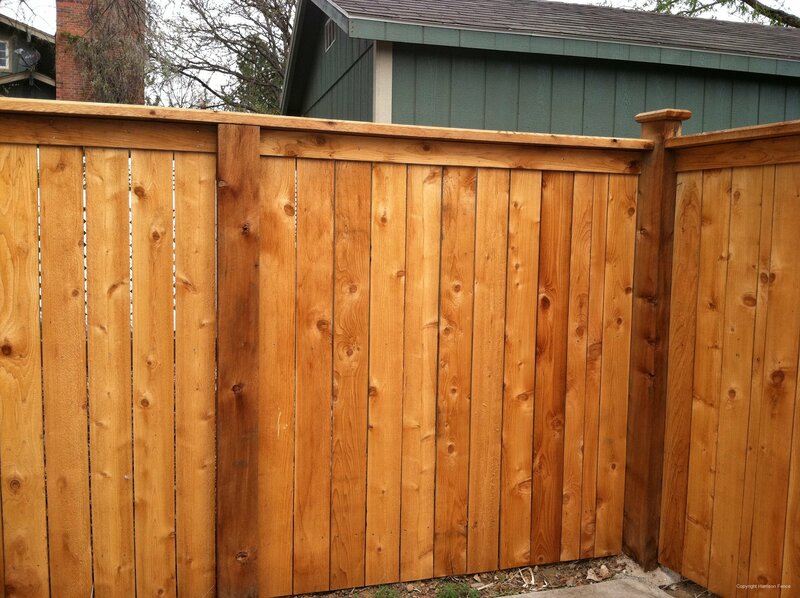 Average lifespan for cedar is 20-30 years! 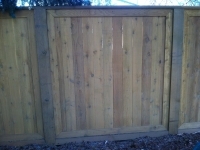 Back-side view of the steel posts with cedar components installed. 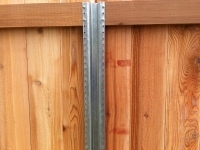 Trim pickets go over posts to hide steel components. Excellent option for windy areas or areas with high moisture at base of posts.